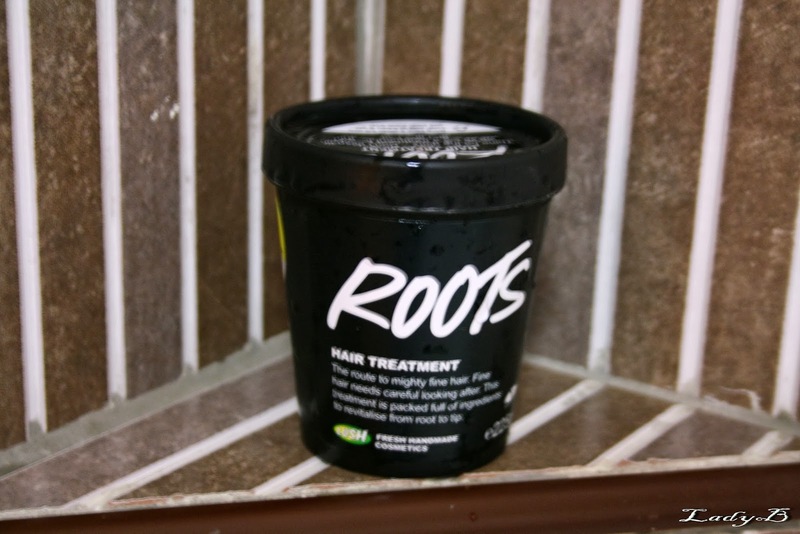 Roots by Lush, I think this a product I'd swear by because I'm loving the results so far . I've been using it for the past month and it's becoming an essential, so I'm stocking up in advance. This hair treatment includes three kinds of mint to stimulate the scalp and hair follicles, olive oil to give condition and strength, honey to soften and soothe and nettle for shine. Delicately perfumed with sweet orange oil and grapefruit oil. Twice a week would do the trick, and it's a mask to be used on scalp and roots I usually run a wide tooth comb to make sure its well absorbed then leave it in for 20 minutes before shampooing . I've noticed that my wavy hair is alot more refined , so shiny and I love how the mint gives this cool and refreshing feeling into my scalp. ماسك رووتز من "لش" صارلي الحين شهر من بديت استخدمه والفرق واضح جدا ، اهوا مصمم حق الشعر الخفيف ولازم ينحط على جذور الشعر فيه 3 انواع من النعناع اللي تشجع على نمو الشعر في فروة الراس وفيه زيت زيتون وعسل وزيوت طبيعية مثل زيت البرتقال وزيت الجريب فروت. انا استعمله مرتين بالاسبوع قبل الشاور واحرص انه اوزعه على فروه الراس واخليه لمده 20 دقيقة. شعري طبيعته متقلبة بس اللحين لاحظت انه الكسرة اللي فيه صايرة مرتبة ولمعته حلوة .الحلو في لش انه اذا يمعتوا 5 علب فاضية تقدرون تاخذون ماسك طبيبعي للويه فري.